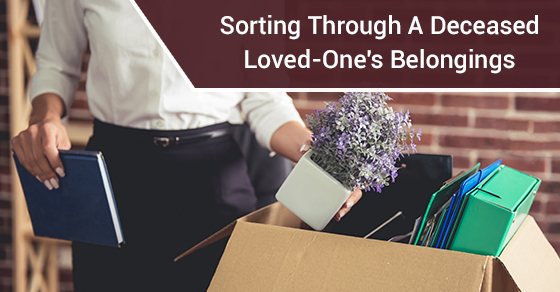 It can be both painful and joyous sorting through a deceased loved-one’s belongings. Years of memories , family heirlooms, photos, decorations etc. Can be tough to deal with, but can also be incredibly heartwarming. If you are given the difficult task of sorting through a deceased loved one’s belongings and want to make the process as pleasant and stress-free as possible, below are some tips to help make your life easier. Many people find sorting through these sorts of belongings inherently unpleasant because there is always a looking fear that you are going to get rid of something that should have been kept and spend the rest of your life regretting it. This is where storage facilities come in handy. You might not be in the frame of mind to make the most objective decisions about what stays and what goes, especially if it is soon after the person has passed, so a self storage unit is a great way to allow you to take some time and make the right decision. If some of the belongings include furniture and heavier items and you have opted to place it in storage while you decide what to do with it, drive up storage is a great feature that allows you to pull your vehicle right up to the doors of your unit. This makes unloading and eventually re-loading furniture and bulky items so much easier. Whether you think what you are sorting through is junk or valuable, it is always a good idea to make an inventory of exactly what you have. You might find yourself sorting through things that you aren’t sure about (whether you are going to keep it, what it’s monetary/sentimental value is). If you have a document you can access in the future telling you precisely what you have you can do better research into what those things are and sit down when you are collected and ready to make hard decisions and really go through things in an itemized fashion. If you find it emotionally too heavy to go through your deceased loved-one’s belongings alone, ask a trusted friend or family member for help. Having someone there for emotional support can make the task of sorting much easier and less distressing. Sorting through a loved-one’s belongings can be tough, but with the right approach, preserving their memories and legacy takes no time or effort at all. Keep the above organizational and sorting tips in mind and make an emotional process as practical as possible.